This month, James B. (a fellow staff Hillside Missions staff member) and I traveled to Canada, India and Los Angeles consecutively. In Canada, members of World Horizons staff and leadership met with the leadership of the ACOP denomination. Together, we’ll be working to send more missionaries to places in the world yet to be reached with the gospel. In India, James and I worked with a team to open the first on-field art gallery in our effort to build an art-as-mission ministry. In Los Angeles, several members of our World Horizons team represented the organization at Biola University’s missions conference. Our conference display included out first pop-up art gallery. The three week trip went great. As a result of the trip, there are new missionaries on their way to the field through our mission training internship, there is a new platform for disciple-making in India, new relationships with universities and ministries are in development for the multiplication of mission sending and I learned new things. The world’s largest dinosaur is in Drumheller, Alberta, Canada. The Indian holiday called “Holi” is my new favorite celebration. If you over-pay the neighborhood boy who collects the trash, he will always expect to be over-paid (and it’s still worth it). In order to start a popular art gallery in India, at minimum you need: white paint ($250), lighting ($200), cleaning supplies ($25), promotional flyers ($20), artists to present art they have made for good purposes ($?). In order to have a popular pop-up art gallery in Los Angeles, you need recycled pallets ($120), white paint ($50), nails and hardware ($50), artists to present art they have made for good purposes ($?). A 5 passenger car has room for more than 5 people. Raw beef works well as a sermon illustration. 5 Hour Energy Drink works well for at least 2 hours. Interested in mission training, sending, art as mission or something else? Feel free to contact me. I’d probably love to talk to you. In the past 2 months, I traveled to Nigeria and Cambodia. Both of these trips were for ministry and I am better because of them. In April, 300 young girls were kidnapped from their school by a terrorist group called Boko Haram. As I learned and prayed more about this (and the many other abductions like it) happening in that country, I felt compelled to go. God gives me a love that makes my going unstoppable. In May, I went to Abuja, Nigeria. I went to Nigeria not because I think it needed me, but because I was moved by the tragedy of the girls’ abduction & if I was one of the fathers, I would find some comfort in knowing that people loved enough to come from far away to stand with me. I went there to love & learn. I think I succeeded. The teams of World Horizons USA and Hillside Missions worked hard and well to be sure the trip was fruitful. I think they succeeded. I spoke, preached and prayed at 2 churches in Nigeria’s capital, Abuja. I attended and spoke at rallies in support of action to rescue the abducted girls. I met and prayed with the Governor of Borno (the state where the girls were abducted). I was also invited to return and travel as the guest of that governor to pray with families of abducted girls. I participated in a simultaneous prayer vigil event held and broadcast at the Nigerian Embassy in Washington, DC and a church in Abuja, Nigeria. 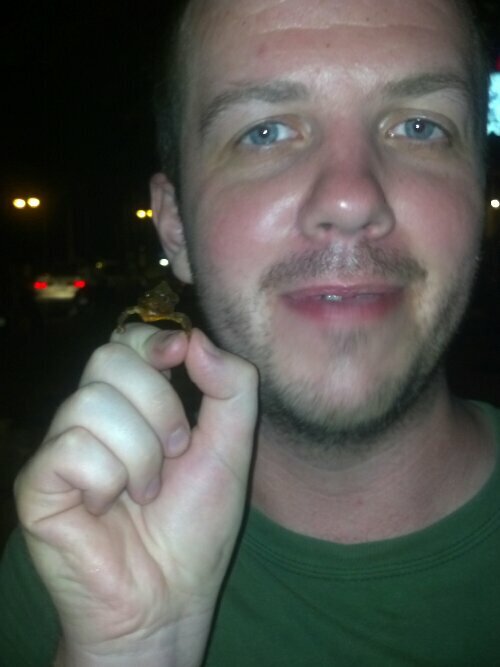 I ate one too many snails. I got embarrassingly ill after eating chicken from a road-side stand. 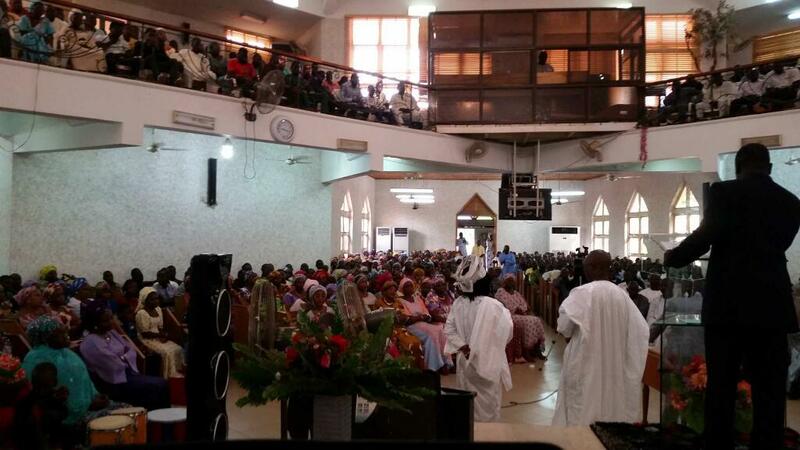 I spoke and prayed at this church in Abuja. Many of the congregants here are relatives of abducted girls. The girls have still not been returned. As of today, It has been 74 days since the girls were taken. We continue to pray for their safe return. We’re also considering further action we can take. One of the possible outcomes of the abduction is that the public outcry against Boko Haram would cause that terrorist group to be broken. That’s our prayer also. 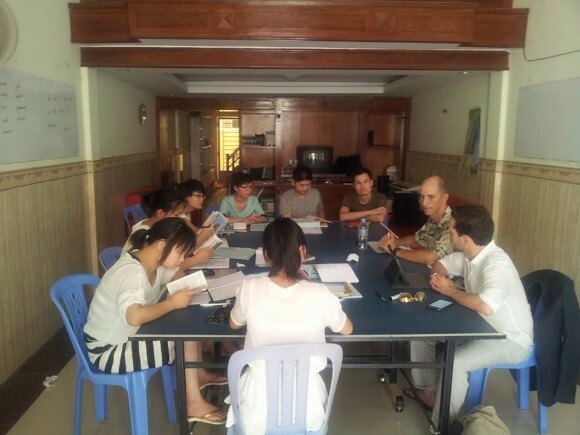 In June, I traveled to Phnom Penh Cambodia because I was invited to help to plan and develop a program to train Chinese missionaries who will plant churches among unreached people in Cambodia. The result of the trip is that there is a training program for Chinese mission interns now operating in Phnom Penh, Cambodia. The program is modeled after the Hillside Missions internship program. More work is needed, but they are already up and running with 9 residential Chinese students. Awesome. The World Horizons USA and Hillside Missions teams are now working to support this training initiative. We’re excited to see waves of Chinese missionaries making disciples in Cambodia. Initially, John and Christa H. (missionaries with Act Beyond) had asked me to come to help them to discuss and plan for how to develop a mission training internship somewhat modeled after what we’ve built here in Richmond. Their aim is to train and mobilize Chinese missionaries into Cambodia (and eventually other nations). I have known and worked among Chinese peoples with the Harrills for about 12 years. Samuel, a long-time Chinese missionary to Cambodia, and John H. have been working together with Chinese people in Cambodia. Samuel recently joined World Horizons as a field member. 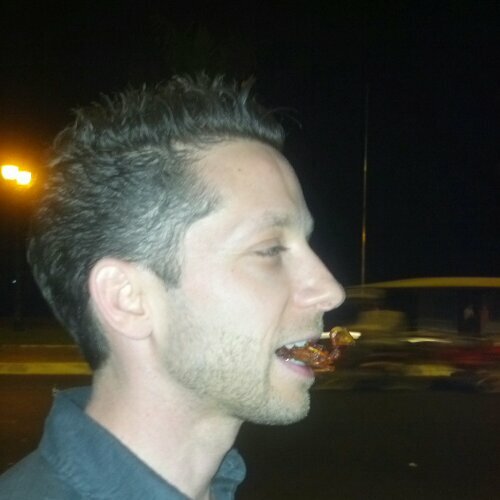 Jonny H. (World Horizons Cambodia team leader) is also supporting the development of the project. In the long-term, the hope is that a multi-organizational collaborative training program for Chinese missionaries could grow in Phnom Penh. 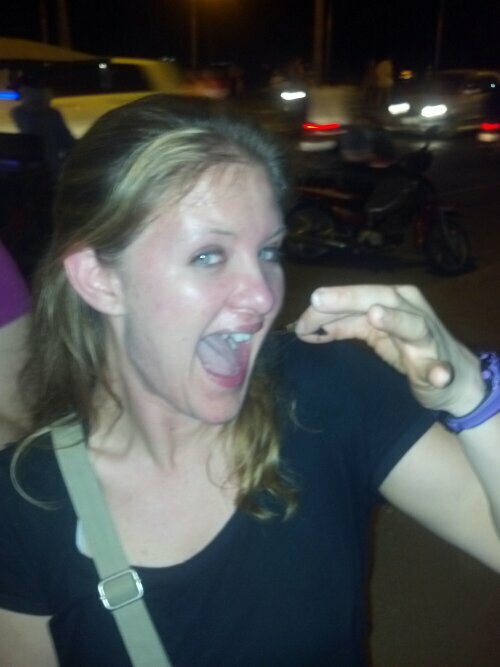 I left Phnom Penh very encouraged. I believe that the time and resources are very right for this. I’m also encouraged by the collaborative prospect that this entails. We are planning a follow-up trip in October to continue to support the formalization of a mission training program there. I met with Hannah Look in Phnom Penh as she arrived to begin a 5-month externship as the final stage of her mission training with Hillside Missions. I ate Japanese food, French food, Mexican food, Cambodian food and Indonesian food. I spent time with old friends and made some new friends. That’s me teaching mission to Chinese students in Phnom Penh. Today began with coffee in the shower. Today, like everyday, began with a cup of coffee in the shower. Yep. And the work day began like every weekday in the office. 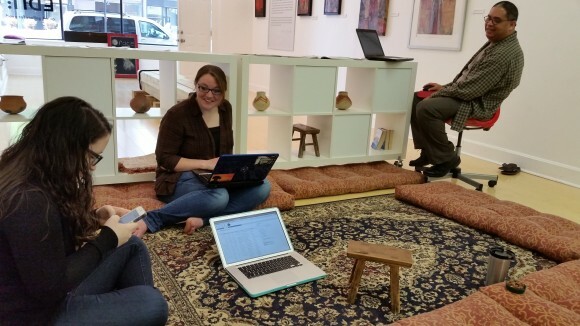 We had a prayer and devotion meeting while sitting on pillows in the small carpeted meeting area of our office/art gallery. On Fridays, instead of reading the next chapter of the Bible as devotional material, we discuss the week’s headlines and pray. This is where I had a second cup of coffee. This is the carpet where we meet and pray. That’s not me. Then, I had a meeting with our Mission Mobilization team members (6 of our staff members working to recruit, train and send new missionaries to the field) to discuss new strategy and our current plan to recruit for next year’s internship (it begins in September. Read about that here). This is Carlos, Kaitlyn and Emery at the Mission Mobilization meeting. After the meeting, I answered some emails about some upcoming events and church services. We attend a lot of events to speak about mission among unreached peoples. I also spoke with a couple people on the field in Central Asia. Then, I met with a staff member to go over a debrief summary report (a summary of a set of meetings and conversations we have to help missionaries to be equipped to manage re-entry into their home country healthily) to be sent to a missionary who recently came home from several years on the field. At 11:30, I met with one of the participants in our Mission Training Internship to talk about her post-internship trip plans and needs. She’ll be going long-term to a country in the Middle East. We talked about fundraising, decision-making, disciple-making and a few other things. 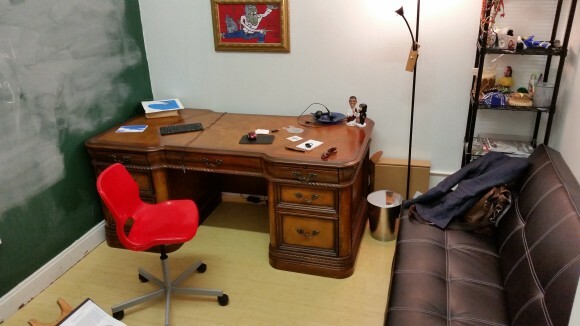 This is my office. Some of my meetings and lots of my work happens here. Can you find the hula dancing doll? I went to lunch at a restaurant near us here in downtown Richmond, VA with 3 other staff members and one staff-member’s mother. We sat outside. Since service at the restaurant was very slow today, I also had to take a scheduled call to talk with someone from another organization about how to get a ministry internship program started. This is when I had my third cup of coffee. We walked the 4 blocks back to the office and joined the rest of the staff to write our newsletters and blogs. The 4th Friday of every month is “Newsletter Friday”. We set aside 90 minutes per month in the office to write updates to our friends, families, supporters etc. I’m now drinking my fourth cup of coffee. 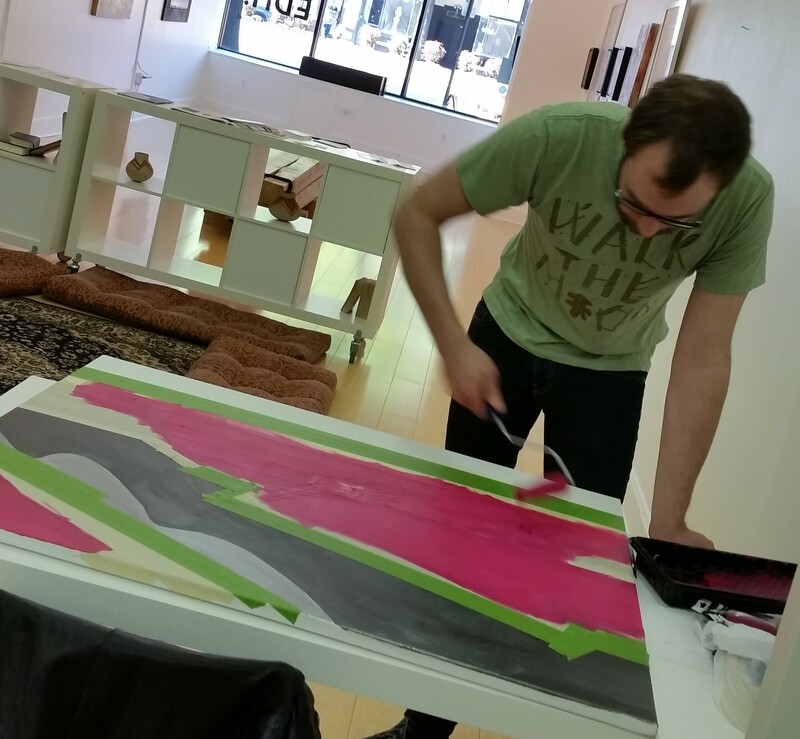 After writing this blog post, I will meet with Ben, our office’s resident artist and Art as Mission ministry leader to talk about the new art gallery exhibit he will open in our organization’s art gallery (Our art gallery has become one of the most popular art galleries in the city of Richmond). This is Ben making art. Tonight, I’ll go home and throw my kids around the living room a little bit while they shoot me with nerf guns and otherwise attack me. Then I’ll make dinner. This is a photo of the time I taught my family how to jump. Later tonight, I will teach some ESL classes for Rosetta Stone. I will also probably grade some assignments for the courses I teach for Liberty University while watching TV with my wife, Yurihn. I will not be drinking coffee. Every day I work toward accomplishing short-term goals along with 3, 5 and 10 year goals. We will make the world better by working hard to accomplish big things that can only be done with long-term work and investment. We pray and work so that people and nations will know about Jesus for the first time. I lead a Christian mission ministry from its U.S. headquarters office. Weekday mornings, I sit on a pillow on the carpet in the office. The 12 to 16 of us meet there to read and discuss the next chapter of the Bible, pray and then talk about tasks and projects. Jonny, one of interns training to do mission, will lead the Bible discussion today. Each of the interns are learning and practicing to lead Bible discussions. After the morning meeting, we work. I balance most of my office time between planning and organizing the ministry’s next activities, corresponding with our team members living on the field in other countries and teaching the interns. This morning, I will lead our group of 7 interns in a teaching discussion about the theology of mission. These interns have come to learn to do mission among the world’s least reached nations. A few months from now, those interns will be sent to various field team locations for a 3 to 6 month mission “externship”. They will then come home and make decisions about long term mission. Interns usually go upstairs to their apartments above the office to eat. Most days I teach online classes over lunch. I teach online for a few different schools as a “side job”. If I’m not teaching for lunch, I like to go to the restaurant across the street. I love being a regular at a restaurant. I’m writing this from my usual seat at that restaurant right now. I’m drinking espresso. We work in the office until 5pm. This afternoon, my wife will teach a session on Spiritual Gifts for the interns, and the staff will each work on the tasks of their ministry area. I will speak, via Skype, with at least one of our missionaries on the field, assign tasks to other staff and prepare some speaking notes for a message I will give later this month at a church in Indiana. This work is more than a job. It is how I am living toward the accomplishment of my prayers and it is how I respond to God’s call. 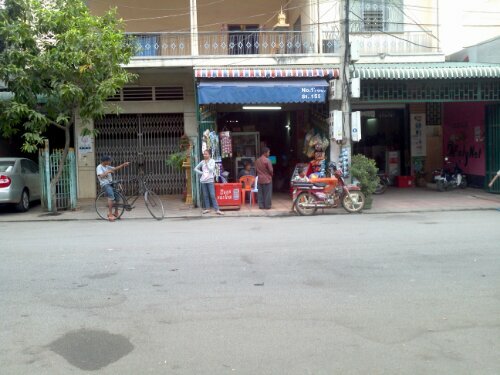 Today, we’ll be visiting a village area a couple hours outside Phnom Penh. A long-term goal is to see a church planted in the area. We’ll be going with some of the long-term team to meet people, make friends and pray. After the village visit, our friend Jon Gordon will take us on a Food Tour in the city. Spiders and fertilized duck-eggs are on the list of scheduled tour bites. Can I eat a fertilized duck egg? I give myself a 50% chance. Is anyone willing to take bets and cut me in on the profits afterwards? The trip is going great! The timing has been ideal and it has been good to have the opportunity to remind our friends here how valuable their work is. Yesterday we had a party and gave gifts to the World Horizons mission team. 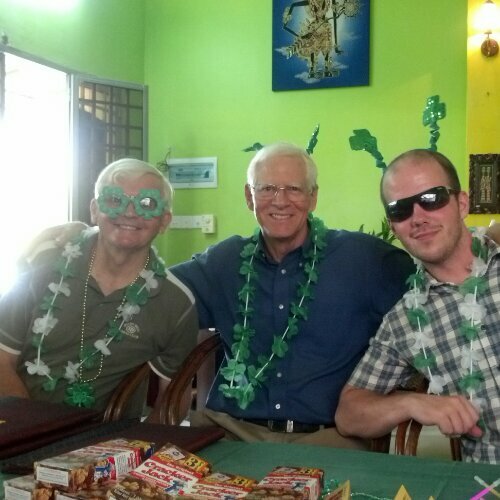 We celebrated St. Patrick’s Day American-Style with cheesy green decorations and accessories in an Indonesian restaurant with 1 Irish man, 1 Canadian woman, 4 English people, 1 French woman, 1 Indonesian and 5 Americans. 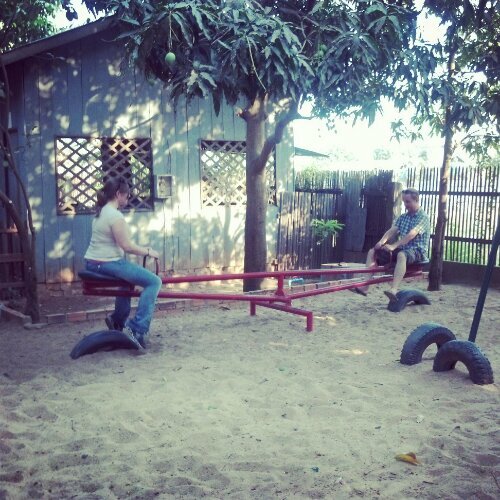 Later, we spent several hours at an orphanage run by our friends. It’s a good and happy place and evidence that the work being done by our team here is achieving long-lasting, sustainable good. I’m proud to be a member of this organization. 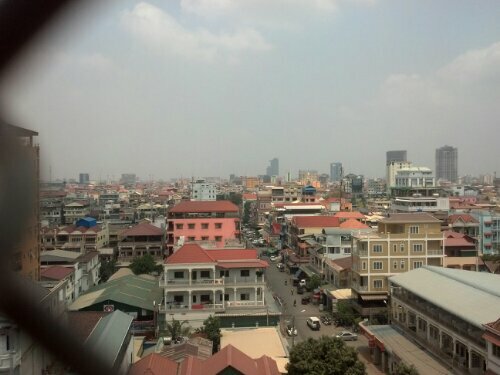 Today, we’ll be working and teaching at a youth outreach program in Phnom Penh. The ministry is called MorningStar. They run daily programs for kids from 5 to 21 years old. We’ll be teaching an English lesson, a lesson on how to make “pizza bread” and a class called “Why are foreigners so strange?” as an introduction to cross-cultural communication and mission. Cambodia has a part to play in God’s plan for the nations. We are the foreigners and we are strange. I just took this photo from my seat at a coffee shop. This boy and girl were flirting with each other. After 3 1/2 weeks of travel, I am back to the more normal routine here in Richmond, VA.
My family and I went to Chihuahua, Mexico for one week. While we were there, we signed a lease on a new facility for the School of Mission Mobilization. It puts the training program right in the center of the city of Chihuahua. Now, we can be more accessible for the rotating faculty and the churches with whom we are partnering. We are still using the original facility in Matachi one week per month. The new property has a swimming pool. My wife and I went to Cancun, Mexico for a one-week vacation. We stayed with a friend who lives there (gracias Claudia!). It was great, of course. I got sunburned and loved it. I went to Liverpool to visit Anna Ridley. She is a member of our World Horizons team and she is in the hospital with an extreme form of Guillain-Barre syndrome. She is currently paralyzed by this condition, but she’s getting better. We picked on each other and prayed together. While near Liverpool, I also visited (and stayed with) other friends and fellow members of our organization – David and Lesley Skews. We ate, drank, talked and had fun. David taught me that Liverpool is where God lives. I spent the next week in Wales attending a 30 year anniversary celebration and conference for World Horizons. More than 300 of us got together for this celebration and I met lots of people doing great things around the world. I also collected as much Welsh food experience as possible. 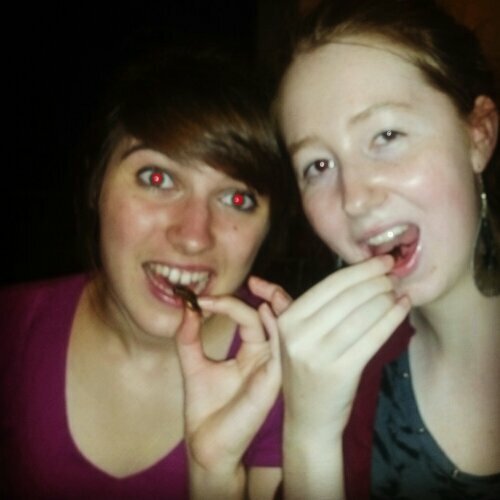 Thanks to my Welsh friend Mike Adams, I accumulated a good list of food-firsts. How do you do Art as Mission? We have an art gallery. We want to have conversations about Art as Mission. In May of 2012, Hillside Missions, in collaboration with World Horizons USA opened the Edit: art gallery as an “Art as Mission” ministry. We’re a community focused on the world’s need for Christ. Art is an important part of community and worship. Right? 1. To connect art, artists and lovers of art to mission. 2. To pioneer reproducible expressions of art as mission. We talk about “Mission” as inviting people to follow Jesus in places where he is not yet known. Art as mission creates a space to invite those people to follow Jesus through and around the production and exhibition of art. 1. We rented an art gallery in the Gallery District of Richmond, VA as the headquarters for our mission ministry. How many people get to say that their office is in an art gallery? We’re cool like that. 2. On the first Friday of every month, there is a popular “First Friday Art Walk” event in our neighborhood. During that event, we feature a new Christian artist who is producing art as worship or ministry. In this way, we are participating in the art community in Richmond, VA.
3. We hang a large poster of a statement from the featured artist. 4. We “advertise” with a sandwich-board sign on the sidewalk and keep the gallery open Monday through Friday 9AM to 5PM. Will you help me to make this a conversation? What do you think? What should “Art as Mission” look like? I’m excited. I have recently accepted a position as the Executive Director of World Horizons USA. World Horizons is a multi-national mission organization with more than 300 members working to establish Christian community around the world. I already like those Horizons people. They’re a great family and I’m honored to be welcomed into it. I will be directing the U.S. office. In this new role, I will be responsible for crafting vision and executing strategy to train and send missionaries to the field. I won’t be leaving Hillside Missions Organization. I will work to direct both of these communities toward a common goal: Creating access to Christian community in every nation of the world. This kind of close collaboration and structure is unorthodox – and I like it that way. I will officially take the new position in January, but I am already in the transition process. Hillside Missions and World Horizons have been working together for about eight years. They are two separate organizations that make a great team. We will continue to work this way. Hillside has cross-cultural ministry training programs in the U.S. and Mexico, short-term mission trips, a structure for education and group presentations and a young voice and perspective in world mission. Horizons has long-term teams in more than 40 countries, cross-cultural training programs in South America and Europe, and 30 years of successful ministry around the world. I believe that by collaborating even more closely, we will make measurable progress toward finishing the global mission task. My family and I want to be running toward big dreams. We want to let our purpose shape our lives. Pray as I find the right vision and strategy for my family, Hillside Missions and World Horizons USA. You’re the community around me and I need you. Please share your ideas, encouragements and biscuit recipes. I am interested in creative ideas for mobilizing a significant number of Christians to strategic places so that we can see access to Christian community for every nation in our generation. Got any? We’re growing. There are some specific positions to fill in these ministries. Is there a place for you in our plan to reach every nation?